This particular soup is filled with red lentils and therefor super savory! Lentils are high in proteins. they give you a satisfied feeling for quite some time! This soup makes also a good meal after a workout; the proteins support the recovery of your muscles and supports the strengthening of your bones. 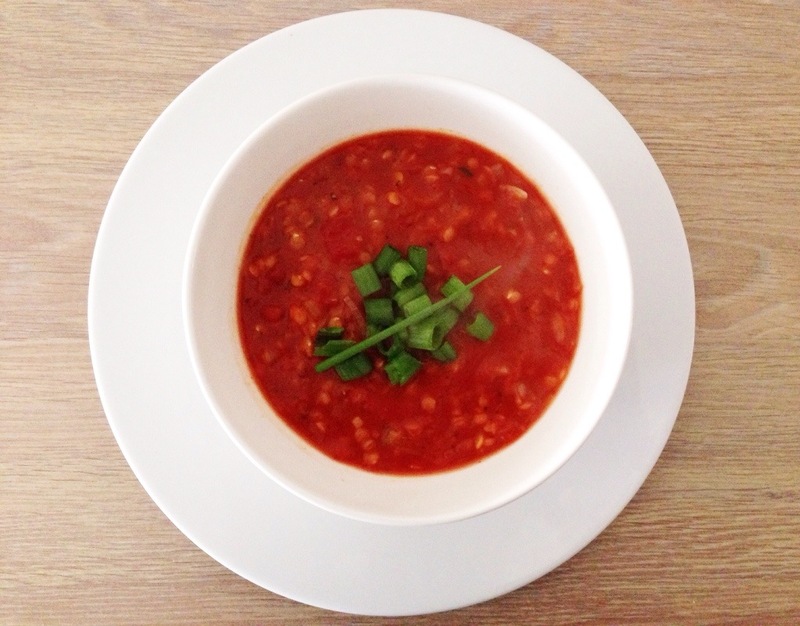 This soup is also loaded with tomatoes (fresh and canned) which provide you with a lot of vitamins and minerals! Super healthy! Tomatoes are high in caroteen (also found in carrots for example). Caroteen is important for our imunesystem and supports our skin against the danger of UV-radiation. Tomatoes are also high in Lycopeen. These fytonutrients are not produced by our own body, we have to subtract it out of plantbased foods (such as tomatoes, carrots, watermelon and grapefruit). It’s said Lycopeen has positive effects on our health, it might give lower the odds for cardiovascular disease and types of cancer. It also reduces the negative effects of UV-radiation to our skin. Fry the onion in a little olive oil, together with the garlic. Add the shredded carrot and fry for another minute. Add all the other ingredients (except the spring onion and herbes) and bring to the boil. Boil the soup for about 20-25 minutes until the lentils are cooked. Add the dried herbs (for example oregano) and stir. Serve in a bowl and garnish with some chopped spring onion. Posted in Background information, Diner, Lunch, recipes, Soup, VeganTagged comfortfood, dairyfree, diner, dinner, fit, food, glutenfree, glutenvrij, healthy, healthy lifestyle, legumes, lunch, natural, recipe, soep, soup, soyfree, sugarfree, suikervrij, vegan, vegetable, vegetables, vegetarian, veggie, veggies, zuivelvrijBookmark the permalink. Yum! Ik hou echt van linzen, in soep in alles!! Ik zal binnenkort eens een salade met linzen maken, ook heerlijk! Ideaal als on-the-go lunch of dinner! Bij mij staat er deze week ook een tomatensoepje op de planning!